With the seasons changing many of our garden herbs are coming to a end (except our Oregano which I’m pretty sure is going to grow forever). Most herbs tend to love this time of the year but the weather tends to change quickly in mid to end October, so we always plan ahead in preserving our herbs before it’s too late. One frost is all it takes to kill a lovely cilantro plant – don’t let it happen to you. Freezing and drying herbs in multiple ways makes your garden season last even when there is a foot of snow out on the ground. Need some basil? No problem. Just dry it and crush it up – then you will have basil to last you forever. Same goes for so many other herbs. Also if you don’t have a garden, no worries. 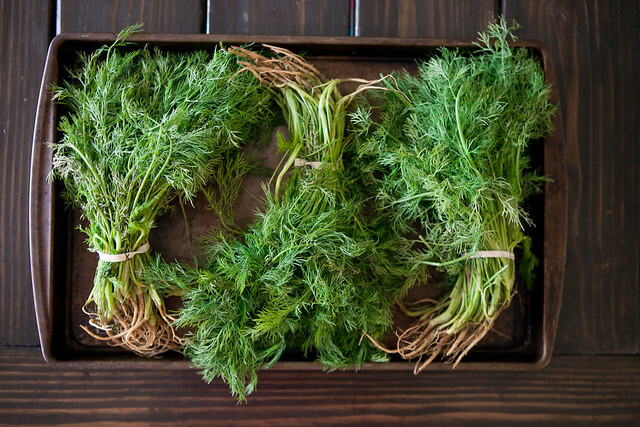 Maybe you’re at the farmers market or grocery store and you see a great sale on dill or parsley, grab it, dry it and you’ll have dried dill and parsley to last you the next year. Here are some ways I use our herbs to make them last as long as possible. Cilantro: Cilantro is a tricky herb to preserve, but hands down one of my favorites to cook with. In my opinion dried cilantro loses its taste, but you can absolutely freeze cilantro in ice cube trays. Just throw your cilantro in a food processor with some water to turn into a puree, then transfer to ice cube trays and freeze. When you need some cilantro, just pop it out, defrost and use. I often times use frozen cilantro in fresh salsa and it tastes great. 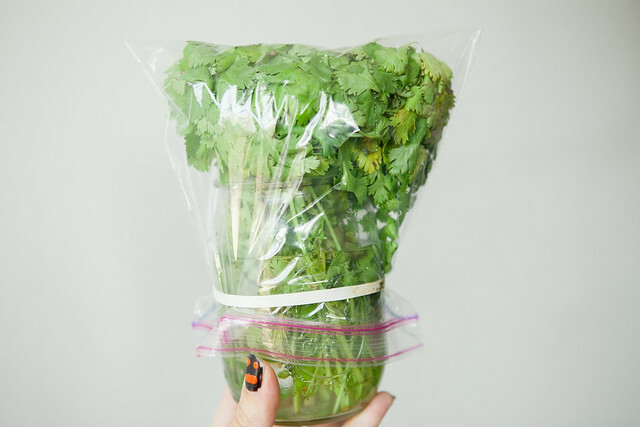 If you’d like to keep your cilantro lasting longer in the freshness department, this is my suggestion on how to store it. 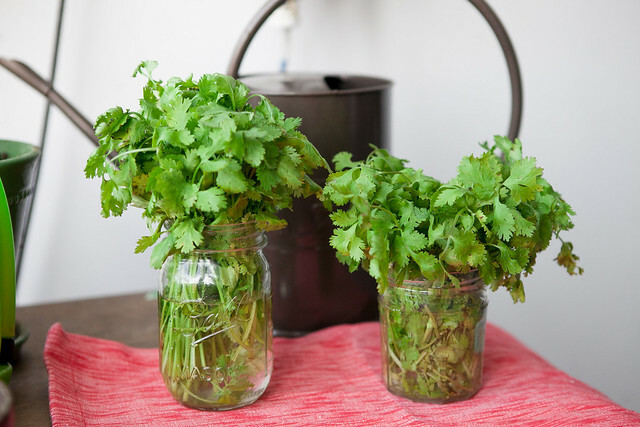 This technique keeps your cilantro fresh for at least 2 weeks in the refrigerator. First, cut your cilantro stems down a little bit. Then fill a glass jar with some water, insert cilantro. Then put a plastic baggie on top and rubber band it to the jar so it’s secure. Put into your refrigerator. Replace your water as it turns brown. Whenever you need some cilantro, just take out the jar and use accordingly. This is our cilantro after about 10 days, still looks pretty great to me! Mint: I love mint, I love everything about it, especially the smell! 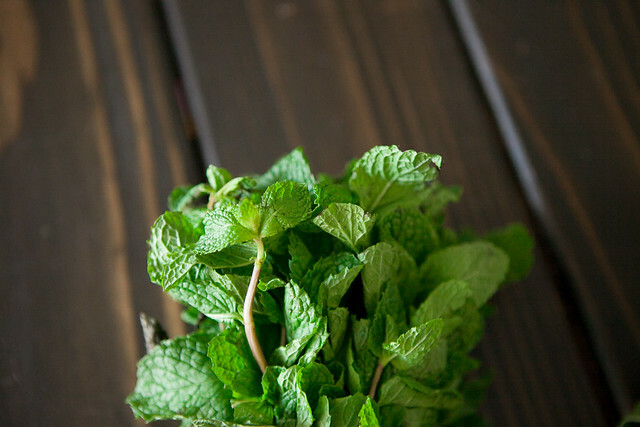 Isn’t mint just one of the most heartiest prettiest herbs you’ve seen? I could just squeeze mint’s cheeks it’s so pretty! 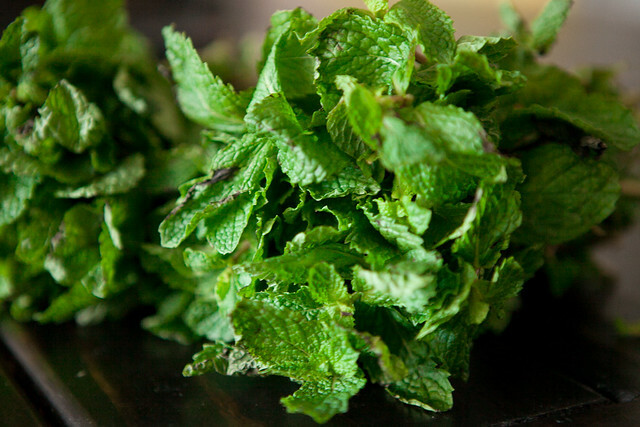 I enjoy mint mostly in drinks, either in cold drinks or a great natural herbal tea (post coming soon!). I drink alot of water throughout the day, especially fizzy Seltzer water, but what makes it extra special is some mint with it. 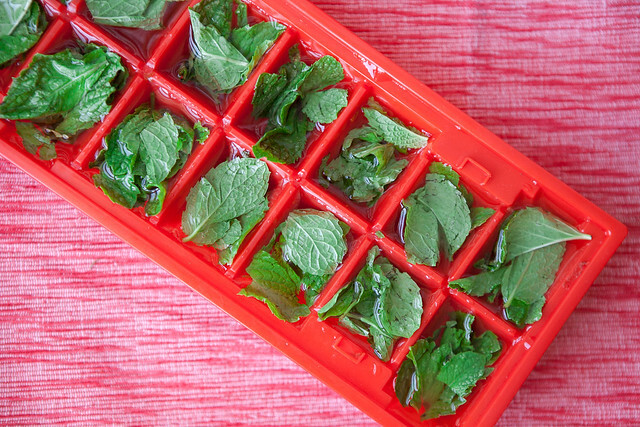 To make mint ice cubes, just rip up your mint leaves and throw in a ice cube tray. Then on top fill up with water. Don’t be scared to really fill up these cubes with mint, use as much as you want. 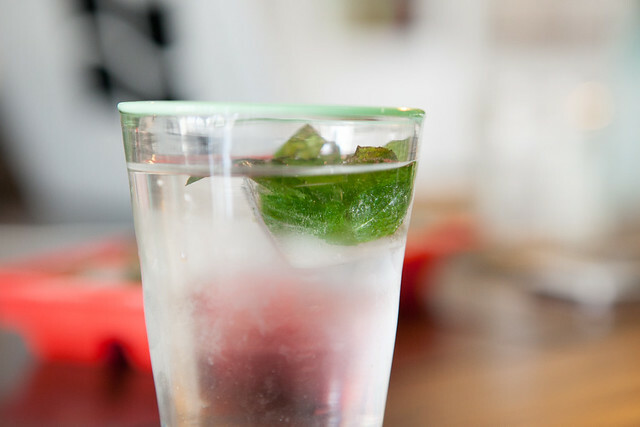 Then when you grab a drink of water, pop out a mint ice cube and it freshens up your drink. This is great in iced tea and lemonade as well. Dill and Basil: These herbs work great dried so you can cook with them for a endless amount of time. Before we had a garden I would buy dried herbs but not anymore. Drying your own herbs is very economical, not to mention the taste will defeat the store bought bottles! 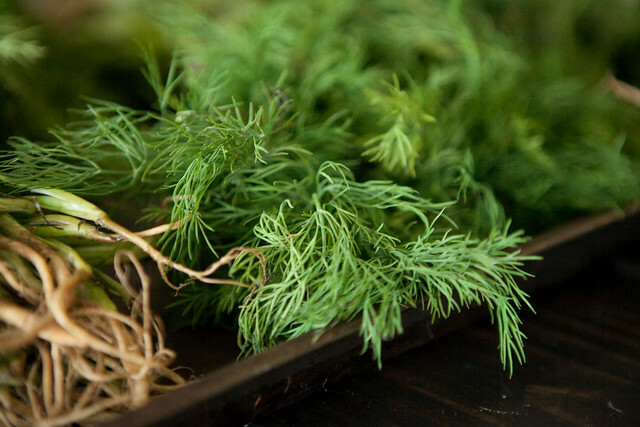 Dill: I love dried dill in soups, stews and rice dishes. Dill is also up there on one of my favorite smelling herbs, it puts me in a good mood almost instantly. Maybe I should invent a dill perfume! 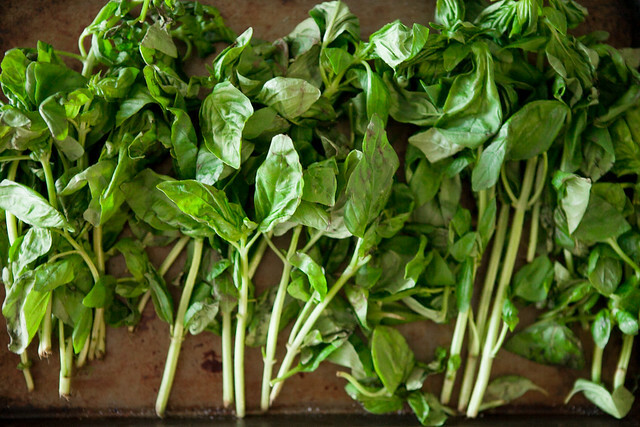 Basil is a staple in cooking, both fresh and dried. It’s hands down one of the dried herbs I use most in cooking so I always have a few jars filled up in the kitchen full of it. To dry your herbs, clean and let dry. Then take a rubber band and tie them up in a place in your home. The dryer the place in your home, the better, but in a loft space like I live in all my living area is pretty equal and I’ve found that herbs dry great pretty much anywhere. Let your herbs dry for a few weeks, usually 3-4 weeks. You will see your herb leaves start to turn crispy. Once the entire bunch is crisp, then untie, remove leaves with a shake above a bowl and crush. I do this the easy way by throwing in a food processor. A few pulses later and you have dried herbs ready for cooking use. 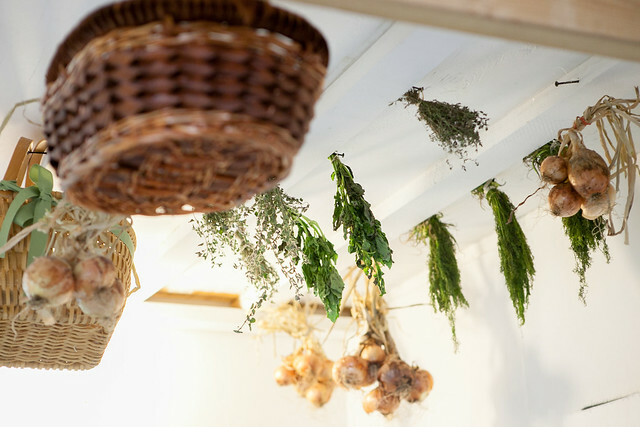 When you walk into our home the first thing you see hanging are herbs and onions. Can we talk about how great your home is going to smell because of these herbs too? Dried herbs tend to be much stronger than fresh herbs. 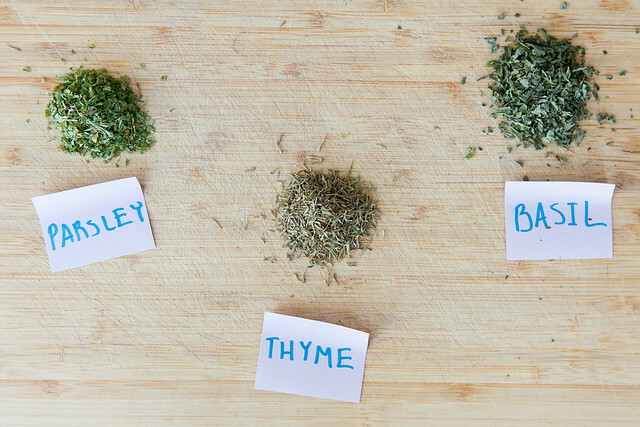 When substituting dried herbs for fresh herbs, use 1/3 the amount that the recipe calls for. Store your dried herbs in jars. Dried herbs made direct from your garden make an amazing holiday present. Tie a little bow around a couple of glass jars and you will win the hearts of many! suggestions for rosemary?!?!?! I killed all of my herbs except the rosemary eek! Need ideas! 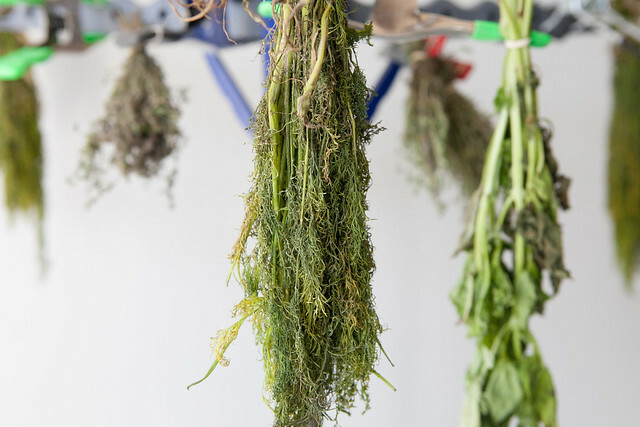 I dry rosemary the same way as the dill and basil – just hang up to dry and then remove the stems from leaves. Enjoy your dried rosemary! i love that tips…especially for the cilantro..that is my favorite herb to cook with as well. I love the photo of the herbs hanging upside down to dry out. I LOVE this. I am actually trying to grow my own herbs at the moment, so stay tuned, and thanks for the advice!!! What a great educational post! I think your house must smell amazing. Great tips for storing herbs, I usually put in water and stick in the fridge but never heard of the plastic bag and rubber band, Going to try that, you dry your herbs like I do roses, never tried that either, Learned a lot! This is a fantastically helpful post – thank you! Thanks for the great tips! Cilantro is one of my fave herbs to cook with too. I bet your house smells so wonderful with all these dried herbs:) Great post, thanks for sharing Pamela! I’m really happy to see this. I just started gardening, if you can even call it that. And I have a very small amount of basil so I don’t think there is enough to dry it. But I’m most definitely using your tip for cilantro and pinning this for next year, when my garden hopefully explodes a little! Great information! Especially the cilantro trick! This was SO helpful, I’m going to come back to this when I need tips for preserving herbs! Love the idea of freezing cilantro…why did I never think of that?! You’re right – that would be a great idea for a gift for people! Can’t believe how long your cilantro looked nice for. Have a great weekend! Very timely! I have an abundance of basil (and jars and jars of frozen pesto) that I was thinking of drying. I am going to give it a go. Sounds like a yummy harvest! This post is so informative. I needed that cilantro advice…I keep mine in the fridge and it is always dying!! All these tips are wonderful – great to know how to keep them. This is such an awesomely informative post!! I am definitely going to have to try that cilantro trick! I really like the mint icecube idea, great. Great idea with the cilantro. Loved the title, too. I love all of these fantastic tips…especially the cilantro one! 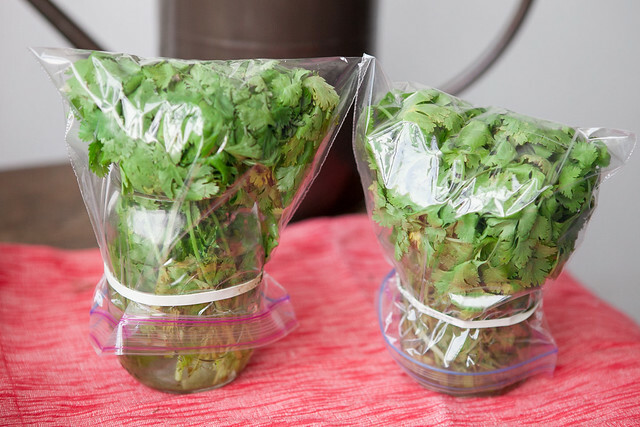 I love freezing my herbs – especially cilantro! Cilantro is pretty expensive here in Buenos Aires and I don’t use all of it – so I just freeze them in ice cube trays just like freezing basil pesto! Thanks for sharing this tip – I have never tried this method before in the fridge! I just chopped and froze all of my savory herbs in ice cube trays filled with olive oil to cook with later… fingers crossed that it works! Thanks so much for sharing! I was having a hard time with my herbs and this soooo helps!! PS….you totally can get Dill as a perfume!! Young Living Essential Oils sells better than organic, pesticide free, purely unadulterated essential oils! An amazing use for herbs after freezing in butter – melt the butter and use it to top popcorn. If you are a popcorn lover, this will rock your world. You can go all bougie with it and brown the butter for a couple of minutes in a little skillet, or pop it in the microwave to melt. Dash of sea salt and done. 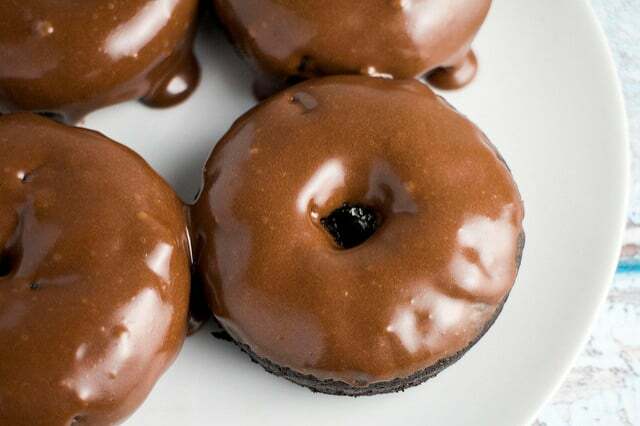 Yum,I love that idea! It’s delicious for mashed potatoes or sauteeing vegetables too! Thanks SB! I freeze a lot of my herbs, dill, lovage and parsley. Would you recommend this? Yeah! I love to freeze mine in a little bit of olive oil – perfect for adding straight into a pan or an Italian soup!